So, the big news lately featured a certain second son of Princess Diana and his efforts on behalf of a landmine free world by 2025. At Kensington Palace on April 4th, Prince Harry delivered a powerful speech calling on people and nations to commit to a mine free world. Harry’s call, made personal by his own visits to minefields in Angola and Mozambique (and presumably by what he saw during his tour of duty in Afghanistan), was quickly answered by the British Minister for International Development, Priti Patel, who announced a three-fold increase in British funding for mine action (The HALO Trust; Mines Advisory Group). Many other countries have made similar pledges for new or sustained funding for mine action (Landmine and Cluster Munition Blog), but what I have not seen are pledges from the mine-affected countries to meet their obligations to clear minefields and support survivors. With new money available, mine-affected countries need to step up and meet the challenge. For the first time, Somaliland’s parliament ordered the deportation of two foreigners who had “disrespected Islam.” Both of the individuals deported worked for the Danish Demining Group (DDG) which conducts community safety programs including mine risk education and small-scale clearance of landmines and explosive remnants of war (ERW) (All Africa, Danish Demining Group). In the far eastern section of The Gambia, just on the border of Senegal’s Casamance region, a landmine killed a father and his son. The area is known as a safe haven for Casamance rebel groups, but this is the first known mine in the area (Freedom Newspaper). Two civilians were killed by a landmine pace in a village near the border with Israel on the Sinai Peninsula (Al Araby). Another landmine near the Suez Canal killed one person and injured four more. The mine was believed to have been a remnant from the war with Israel in the 1950s (Ahram). In a third incident on the Sinai Peninsula, three people, including two children, were killed and two others injured when their car stuck a mine (Ahram). The government of Japan has made a US $550,000 grant to the HALO Trust to help clear the 20 remaining minefields in Huambo Province. Having already cleared 270 minefields, the HALO Trust is looking to finish the job in Huambo, once one of the most mine-affected areas of Angola (Relief Web). A Cameroonian soldier was killed by a landmine in Nigeria’s Borno State. The soldier was part of the multi-national force fighting against Boko Haram and he was killed when his vehicle struck a mine in the roadway (Cameroon Concord). To support Nigerian capacity to clear landmines and other ERW, the United States government donated training aids and hosted a humanitarian mine action training program at the Nigerian Army’s military engineering school in Abuja (NTA). Two Libyan soldiers were injured by a landmine attributed to the Islamic State in the liberated city of Sirte (Libya Observer). In Benghazi, a military deminer was killed in the line of duty and the Gawarsha neighborhood of Benghazi has been deemed too mine-contaminated to allow for the return of civilians (Libya Observer). A dozen deminers from the Russian company, rsb Group, have been conducting mine clearance in the eastern part of Libya (The Trumpet). I think it’s the little touches in landmine stories that really get to me. In this month’s news, the fact that the reporter felt the need to confirm that when two herders were killed by a piece of unexploded ordnance, “their animals did not survive the explosion either.” In Morocco the fact that a young man’s “kicking” of a landmine set it off, provides a visual. Or in Zimbabwe, a young survivor and his girlfriend cannot marry because he lacks the money to pay for the wedding. These small flourishes show the humanity and the human tragedy of landmines. In response to the Boko Haram insurgency, several vigilante groups emerged from the local populations in northeastern Nigeria to support the Nigerian army in the campaign against the Islamist group. In February, five members of the one vigilante group, euphemistically called the Civilian Joint Task Force (CJTF), were killed and another four injured when their truck struck a landmine left by Boko Haram (All Africa). Four Nigerian soldiers were also injured in a separate incident (All Africa). Cameroonian soldiers are also active against Boko Haram and while Cameroon’s forces have been clearing mined roads and dismantling suspected bomb-making facilities, one Cameroonian soldier was killed and another eight injured when their truck struck a mine on patrol in Nigeria (All Africa). In 2015 the HALO Trust cleared and destroyed more than 4,000 mines and 25,000 pieces of unexploded ordnance (UXO) in the southern town of Cuito Cuanavale (All Africa). In Bie Province, landmine clearance is preparing some 250 hectares of land for industrial development and economic diversification (All Africa). In Cuando Cubango, the deputy governor witnessed the destruction of several explosive devices and noted how demining enables agricultural expansion and market access (All Africa). Two members of the Islamist group, Ansar Dine, were killed when they drove over a landmine planted by other members of the group. The vehicle was headed towards Kidal and had four pieces of ordnance in the back which might have contributed to the deaths of the occupants (Mali Web). In northeastern Mali, Malian soldiers were victims of a landmine and firearms attack which killed four – it is not clear from the report how many casualties are attributable to either the mine or the guns (The Chronicle). In Mopti in central Mali, three Malian soldiers were killed and two more wounded by a landmine (BBC). Near Gao, another Islamist was killed by the mine he was trying to plant with the intention of attacking a Malian army convoy (Mali Actu). Five people were injured, one seriously, when a Moroccan man kicked a landmine in the southern city of Laayoune (Morocco World News). The Gulu Landmine Survivors Association (GLSA) in Northern Uganda has petitioned the government for victim assistance support. Most survivors are living in poverty and prosthetics are prohibitively expensive. Monica Pilloy, the chair of the GLSA, notes that Ugandan soldiers are entitled to pensions and compensatyion for injuries, but civilian victims of the Lord’s Resistance Army, despite the international attention and support for reconstruction, have received little (Uganda Radio Network). In western Kasese district, the Kayondo Landmine Survivors Association called on the government for amendments to national legislation to reflect the provisions of the Convention on the Rights of Persons with Disabilities which Uganda has ratified (Crooze). One child was killed and eight others injured when they played with a piece of unexploded ordnance in Kampala. The football pitch where the boys were playing is opposite an old military barracks (News 24). The 426 kilometer stretch of Zimbabwe’s northwestern border with Mozambique, from Mukumbura to Rwenya, is labelled as “minefield # 2.” 130 kilometers have been cleared, removing over 162,000 anti-personnel landmines. The balance remains to be cleared with the HALO Trust and Zimbabwe’s National Mine Clearance Squadron splitting the duties (Zimbabwe Nation). The presence of the landmines means that the Zimbabwe-Mozambique border hasn’t been formally fixed and efforts by the African Union Border Commission have been stymied (The Chronicle). The HALO Trust’s work is supported, in part, but the Japanese government and during a visit to the minefield, the Japanese ambassador to Zimbabwe called for more awareness of the landmine problem in Zimbabwe and more support from the donor community. Literally putting his money where his mouth is, the ambassador also announced an additional US $635,281 for the project (News Day). The Zimbabwean parliament has recognized that demining is underfunded and the committee responsible for defense activities has called for additional funds. With only US $100,000 provided by the government, some members of parliament have suggested taking up a collection among themselves to support the work (News Day). “Minefield # 1” is near Victoria Falls in the northeast of the country and the National Mine Clearance Squadron had sole responsibility for its clearance. Declared clear in 2015, over 26 thousand mines were destroyed (Harare 24). The third major minefield (not sure if it is formally known as “Minefield # 3”) is along the southern border, near Sango Border Post, where Zimbabwe, Mozambique and South Africa share a border. One area of the minefield, Gwaivhi community, is a place “where you can hardly find a family that has not been affected in one way or the other by the landmines. Some families lost their members while others have been maimed. Other families lost their livestock. The area is not suitable for human habitation and therefore has no settlements but those on the periphery of the area have been affected.” Zimbabwe army engineers are clearing the minefield and in 2015 the Defence Minister provided 15 artificial limbs to survivors from the community (Sunday News). The US Army’s Africa Command (AFRICOM) sent two US Navy explosive ordnance disposal (EOD) trainers and a corpsman to work with and train Tanzanian soldiers on EOD techniques as part of the regional command’s capacity building program (AFRICOM). A South African man was seriously injured by a piece of unexploded ordnance that he had somehow acquired from an army training ground near his home. The range is well marked and fenced, but still poses a danger to local residents (Defence Web). The Libyan army has liberated areas of Benghazi and has warned local residents about the possibility of landmines and other explosive devices. The army’s engineering teams were sweeping the Laithi neighborhood and asked residents to accompany engineers in order to access homes and secure personal possessions (Al Wasat). The dangers from ERW were made clear when one soldier was killed and two others injured by a landmine in Benghazi, the second such incident in less than a week (Arabs Today). Two herders were killed along with five of their camels by a piece of unexploded ordnance in Darfur’s East Jebel Marra (Radio Dabanga). To combat landmines and ERW elsewhere in Sudan, the government of Italy donated 250,000 euros to the United Nations Mine Action Service (UNMAS) program in Sudan. the funds will be used to clear 900,000 square meters in Kassala state and provide mine risk education to 5,000 people (United Nations). Both Burundi and Rwanda have declared themselves to be anti-personnel landmine free after completing clearance. Neither army should have these weapons in their arsenal, but allegations that surfaced this month should raise questions about their use. Some Burundian rebels were interviewed by United Nations monitors in the South Kivu province of the Democratic Republic of Congo. The rebels claimed that they had been trained in the use of anti-personnel and anti-tank mines by Rwandan army regulars to be able to overthrow the government of Pierre Nkurunziza, the Burundian president who recently ran for a third term in violation of the constitution (Voice of America). In Somaliland, a young man who overcame the loss of both arms and his sight to a landmine explosion to attend college and complete his degree has resorted to asking for charity in a newspaper article (Somaliland Informer). Norwegian Peoples Aid (NPA), which has been conducting mine risk education programs in Western Sahara for many years, has recently commenced landmine clearance activities in the region. With two teams now working in the country, NPA is hoping to contribute to a mine-free Western Sahara (NPA). Two archaeologists were killed and third wounded at the Tel al-Dafna site near the Suez canal. The area had been subject to extensive landmine use in the Egypt-Israel wars of 1956, 1967 and 1973 and the archaeologists apparently set off a mine during their excavations (Mada Masr). The brotherhood of mine-free countries has now increased by one: Mozambique. In September, after two decades of work, the last of Mozambique’s 171,000 landmines has been cleared from what was once thought of as one of the five most mine-affected countries (along with Egypt, Cambodia, Angola and Afghanistan). When mine clearance first began, Mozambique was thought to have millions of mines to be cleared after the wars of liberation in the 1960s and 1960s and the civil war from 1975 to 1992 and clearance would take centuries, not decades. Many organizations, including the HALO Trust, Norwegian Peoples Aid, Handicap International and APOPO, took part in the clearance work alongside the National Demining Institute, whose director proudly announced “Now I am jobless.” (All Africa; All Africa; The Guardian; Storify). Despite this very good news, Mozambique continues to face a problem of unexploded and abandoned ordnance. In Manica province, a building company discovered a cache of explosives during a construction project and deminers from the HALO Trust were called to dispose of the items (All Africa). The Al Shabaab militia, which has been pushed out of much of Somalia in the last few years, has found a new haven in Kenya’s Boni Forest, just across the border from Somalia. To protect their base, Al Shabaab members are alleged to have laid landmines on the roads used by Kenyan security forces (All Africa, All Africa). In Somalia proper, Al Shabaab continues to use landmines and explosive devices as part of its asymmetrical strategy. In the coastal town of Merca, four civilians were killed by a landmine that was intended for a convoy of African Union peacekeepers (All Africa). A Swedish mine clearance expert working on assignment for the United Nations was injured by a landmine that detonated under the armored vehicle he was traveling in. No word on other casualties (Radio Bar Kulan). A Somali deminer was killed by a landmine he was trying to clear in Bardere town which had recently been liberated from Al Shabaab (Mareeg). Unexploded ordnance claimed the lives of two children in the Middle Shabelle region and injured at least two others (Garowe Online, no link). The commissioner of El-Ade was wounded by a landmine that was reportedly placed within his residence. This was the second assassination attempt on the commissioner (All Africa). A landmine was also placed within the Waamo stadium in Kismayo, but Interim Jubbaland Authority forces found and cleared the mine before it exploded (Goobjoog). A cattleherder was arrested for setting a cache of South African-made explosives he had found on fire. The herder, in addition to his legal troubles for illegally detonating the abandoned ordnance, has developed hearing problems (All Africa). In other parts of Namibia, unexploded ordnance has been deadly. A woman reported an unexploded bomb in her farm fields to the police, but the police did not respond and a few days later the woman and her daughter were killed by a bomb blast which injured two others. Relatives of the deceased allege police negligence in their response to the reports of ordnance despite the Namibian police mine and explosive awareness campaigns (All Africa). Nearly 13,000 pieces of unexploded ordnance, including dozens of landmines, were destroyed in Cunhinga municipality in Bie province (All Africa). In Chitembo municipality, also in Bie province, another 300 pieces were detonated (All Africa). 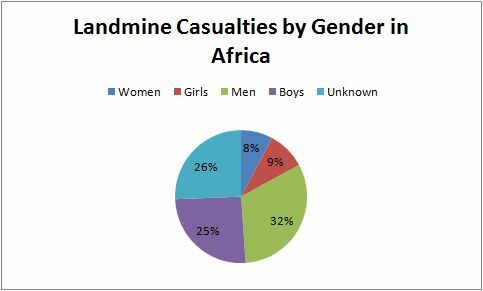 Despite the progress, at least five landmines accidents have been reported in Bie province in 2015 with an unknown number of casualties and mine action authorities called for more mine risk education (All Africa). 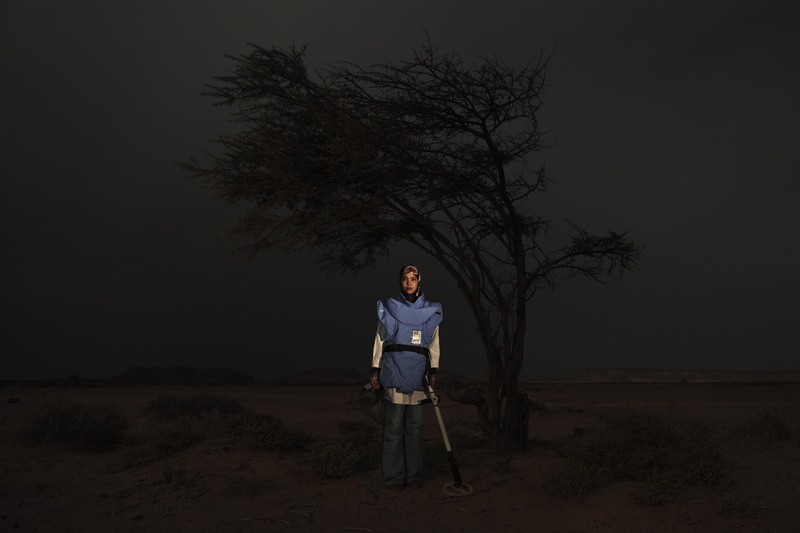 Over 7,600 landmines were cleared from Algeria’s borders. The mines, dating back to the liberation war against the French colonial administration. To date over 1.4 million mines have been cleared from Algeria to date (All Africa). A flock of sheep set of a landmine in El Kef. No other casualties were reported (All Africa). Five children were killed and two more injured by a landmine in Benghazi’s Benina district. The mine was blamed on the Ansar Al Sharia group which was pushed out of the city by the Libyan army (Al Bawaba). 15 alleged terrorists were killed and another 10 injured when the individuals tried to plant several landmines in Rafah on Egypt’s Sinai Peninsula (El Balad). Also in the Sinai, three boys were severely wounded by a landmine also attributed to terrorist elements (Star Tribune). The Nigerian government has ordered 10 demining machines from a Slovakian company with delivery to be completed by the end of 2016 (Spectator). The need for such machines was highlighted when a cow triggered a landmine, killing the nine year-old boy who was minding the herd and at least three cows (Daily Trust). Despite the civil war that erupted in South Sudan in December 2013 between the government and forces loyal to ousted vice president, Riek Machar, the United Nations Mine Action Service (UNMAS) and its partners have managed to clear 12 million square meters of land and 1,000 kilometers of roads of landmines and other explosive remnants of war. The violence has greatly reduced UNMAS’s ability to clear land as prior to December 2013, UNMAS has been able to clear over a billion square meters and return that land to productive use (Star Africa). As part of AFRICOM’s efforts to increase the capacity of African national armies, especially those which contribute forces to regional and international peacekeeping missions, US Navy explosive ordnance specialists provided training to 22 Tanzanian soldiers in August. The humanitarian mine action instruction course is funded by the State Department (AFRICOM). Landmines are seen as both a challenge to peace in Senegal’s Casamance region (All Africa), as well as an enabler of the illegal logging that supports rebel groups in the region (All Africa). To combat the landmine problem, Pax Mondial will provide several mine detection dogs to Handicap International which has long been clearing mines in Senegal (Pax Mondial). The announcement of Mozambique as a mine-free country will hopefully spur other countries to complete their mine clearance obligations. Somaliland announced its intention to be mine-free by the end of 2017 (Somaliland Informer). Two stories this month, including one by United Nations Development Programme (UNDP) administrator, Helen Clark, provide a lot of context to the landmine situation in Angola. Clark’s piece details the history of landmine use and mine action in the country describing the scale of landmines’ impact in the country, the number of casualties and the efforts to reduce the risk through mine-risk education and clearance. The second article describes the competition between the United States and China for access to Angola’s markets and petroleum reserves, noting how the US’s support for demining is part of America’s investment in the country. The article also reference’s the US’s past support for the rebel movement UNITA which was responsible for much of the landmine use in the country, many of which UNITA received from the United States (World Folio; World Folio). As Helen Clark mentions, Angola is one of the most heavily mine-affected countries and the news from Angola in December shows the steady progress in the country towards changing that title. Almost 600 explosive devices, including landmines were cleared from 50 kilometers of road in Bie Province (All Africa; All Africa), while some 9,000 residents of the province participated in mine-risk awareness sessions (All Africa). 200 hectares of Kwanza Norte (All Africa) and 1.4 million square meters of Cunene province were cleared of mines (All Africa); 10 kilometers of roads in Cabinda province were cleared (All Africa); and 900 explosive devices were cleared in Zaire province (All Africa). This clearance work will increase agricultural outputs in affected areas (All Africa) and means that landmines and other explosive remnants of war are no longer the leading cause of disability, road accidents are. The Health Minister, José Van-Dúnem, opened a new rehabilitation centre in Luanda, and said “there is a gigantic effort in demining so that landmines stop being a problem and we can just focus on the need to support those who got some disability due to the war” (All Africa) which suggests that survivor assistance has not received the same prioritization as landmine clearance historically, but as more and more mines are cleared, the needs of survivors will be addressed. Like Angola, Mozambique is polluted by landmines from its liberation war with Portugal and then a long civil war after independence. Since the end of the civil war in 1992, Mozambique has been steadily clearing the landmines and this month, Tete province on the Zimbabwean border was declared landmine-free, the eighth province to be cleared of mines. Tete had been the most mined province in the country with 85% of all landmines in Mozambique in Tete. Only five districts (out of 128 nationwide) in two provinces are still suspected of having landmines and the National Demining Institute anticipates all of Mozambique will be landmine-free by April 1, 2015 (All Africa). Two challenges will remain for Mozambique after the last mine is cleared. Thousands of Mozambicans have been disabled by landmines and many, including former soldiers, receive little or no support from the country despite the government’s obligations to its citizens (Al Jazeera). The other challenge will be to find employment for the hundreds of deminers who have been working to free their country of landmines. Some 200 deminers (out of 1,000 in total) are women, including former liberation war soldiers (like former Mozambican First Lady, Graca Machel), who have few employment alternatives once the demining is complete. Demining is skilled labor and the humanitarian demining organizations have invested a tremendous about of time training and educating the demining teams and while some have received job re-training, more will need job placement assistance very soon. Three children from a shepherding family were killed and their mother injured by a landmine south of Burao in the semi-autonomous region of Somaliland. The mine, detonated by one of the family’s animals, was likely a remnant of Somalia’s civil wars of the 1990s (Somaliland Sun). From the ongoing campaign to eliminate Al Shabaab, a number of attacks occurred as part of the asymmetrical tactics adopted by the Islamist group. In the other semi-autonomous region of Puntland, three soldiers were killed and another four injured, two critically, by a landmine as Puntland forces drove Al Shabaab from its stronghold in the Gal-gala mountains (Somali Current). Elsewhere, landmine attacks targeted government forces in Barawe injuring five (Radio Goobjoog, no link), the Deputy Governor of Mudug region and his bodyguard were injured by a mine in Galkayo (Sabahi), and in Kismayo an unknown number of casualties were caused by a mine targeting Jubbaland forces (Kobciye). In Sudan an estimate 50,000 people have been disabled by conflict, many due to bombings and landmines, and prosthetic services are not always available where the amputees live. In South Kordofan state, where the conflict between the government of Sudan and rebel forces is ongoing, there is only one fully functioning hospital, Mother of Mercy, and prosthetic services are provided by Ugandan doctors who travel to the hospital to take measurements and then produce the artificial limbs back in Uganda. The Ugandan doctors then bring the prosthetics to Sudan for final fittings (Voice of America). Peacekeepers with the United Nations Stabilization Mission in Mali (MINUSMA) suffered two landmine incidents. Both occurred near the MINUSMA base in Aguelhok in northern Mali and injured Chadian peacekeepers; three peacekeepers were injured in each incident. Two men, found in possession of small arms and landmines, were arrested after the second incident (MINUSMA; MINUSMA). The United Nations Mine Action Service (UNMAS) has been active in the MINUSMA mission and provided mine-risk awareness sessions for the residents of Gao. The awareness sessions focused on drivers who transport goods in and around northern Mali (MINUSMA). Kenyan security forces arrested two men, accusing them of trying to plant bombs in the road in Mandera town near the Dadaab refugee camps on the border with Somalia (Sabahi). Algeria’s mine action center and armed forces continue to clear the French-laid landmines from the eastern and western borders of the country. In November almost 3,500 mines were cleared (All Africa). Boko Haram in Nigeria is the worst conflict that no one is doing anything about. According to a report by the Armed Conflict Location & Event Data (ACLED) Project, Nigeria is the second deadliest (Somalia is the most) conflict from explosives in Africa in 2014 (ACLED). Thousands of people have been killed, a mini-caliphate in northeastern Nigeria declared, hundreds of girls abducted. Nothing. Next month Nigeria will hold presidential elections and neither the incumbent seeking re-election, Goodluck Jonathan, or his opponent seem willing to address this crisis. Instead we hear the occasional report of an atrocity or receive a video from Boko Haram’s leader making threats against the government and the West. Certainly Boko Haram is well armed (and this report from the Leadership newspaper suggests that Boko Haram are using landmines to defend their territory and has been in possession of heavy weaponry) and has established a very secure stronghold in near the Cameroonian border, but the Nigerian government and military has allowed this Islamist group to fester and consolidate power. Probably a multi-national effort, including Cameroon and Chad which also borders on Boko Haram’s self-declared caliphate, will be needed to dislodge this threat. The question is: when will the Nigerian government have the will to do so? Britain’s Foreign and Commonwealth Office changed its travel advice for Zambia, removing any mention of landmines and instead referred to explosive remnants of war. This reflects the fact that Zambia has cleared all known landmines from its territory in compliance with the Mine Ban Treaty but some risk from unexploded ordnance might remain along Zambia’s borders with Angola, Mozambique and the Democratic Republic of Congo (Foreign and Commonwealth Office). Mine action teams have been active in South Sudan clearing roads and suspected hazardous areas in Unity, Upper Nile and Lakes States. Four landmines were cleared from a community just west of the capital, Juba but insecurity in Jonglei, Unity and Upper Nile States prevents a full mobilization (Relief Web). One soldier was killed and another injured by a landmine in the Kasserine region near the Algerian border. Islamists hiding out in the Kasserine mountains were blamed for the mine’s placement (Global Post). There is renewed concern that the conflict between the Sahrawi people and Morocco over the Western Sahara territory could restart after nearly 25 years. In 1991, a ceasefire was brokered by the United Nations, one of the conditions of which was a referendum on self-determination for the people of Western Sahara, the Sahrawi. Morocco has not allowed the referendum to take place for fear that the Sahrawis will confirm their desire for independence. Instead, Morocco has occupied the region and divided it with a wall, over a thousand kilometers long with millions of landmines to prevent Sahrawi refugees from returning to their homes from the camps in Algeria. Today, more than half the population of the camps are youths, born since the 1991 ceasefire and a growing number of these young men and women are willing to fight for their independence, rather than continue to wait for the referendum (Washington Post). The leadership of the Sahrawi Arab Democratic Republic (SADR), the nominal government-in-exile of the Sahrawi people in the Algerian camps is not reflective of its population. Mohamed Abdelaziz, SADR’s president, has been in power since 1976 and is the second-longest serving head of state (second only to Cameroon’s Paul Biya) and the only four men have served as prime minister of SADR during Abdelaziz’s rule, the latest in the post since 2003. In any other country, this situation would be viewed as a dictatorship and the willingness to return to conflict with Morocco may reflect not only the sincere desire of the refugees to return to their homeland, but also disaffection with their long-serving leaders.